Punjab (Urdu: ?, Shahmukhi Punjabi: ???? 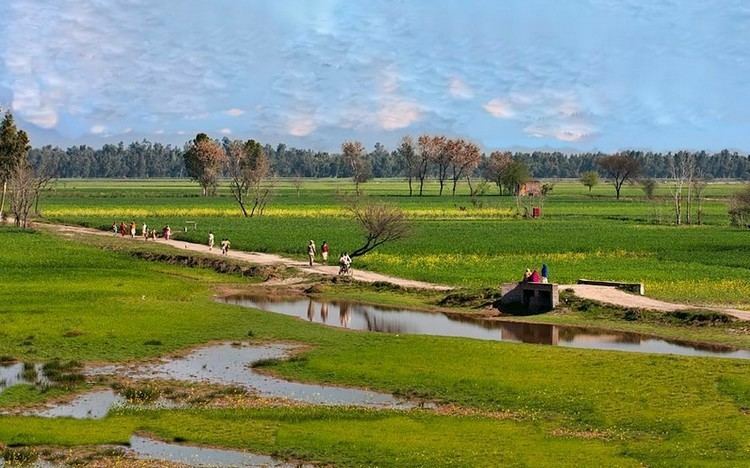 ?, panj-ab, "five waters": listen ), also spelled Panjab, is the most populous province of Pakistan with approximately 56% of the countrys total population. Lahore is the provincial capital and Punjabs main cultural, historical, administrative and economic center. 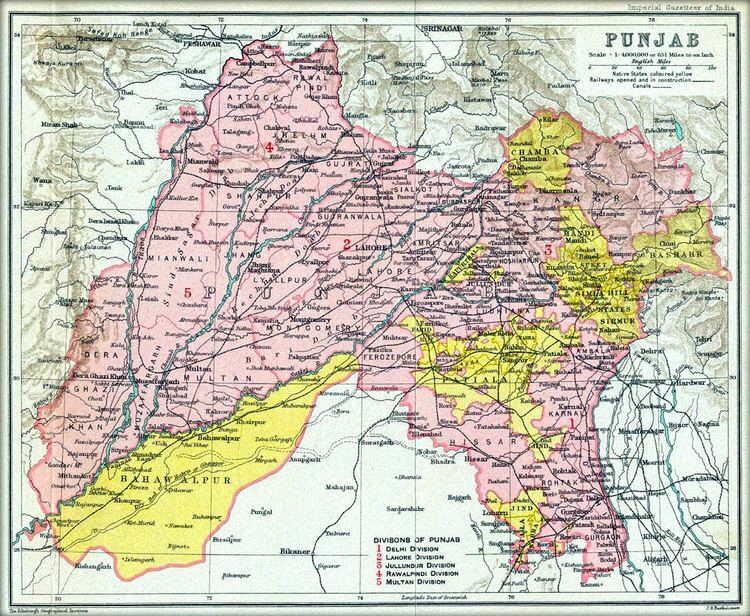 Punjab is Pakistans second largest province in terms of Land area at 205,344 km2 (79,284 sq mi) after Balochistan and is located at the north western edge of the geologic Indian plate in South Asia. The province is bordered by Kashmir (Azad Kashmir, Pakistan and Jammu and Kashmir, India) to the north-east, the Indian states of Punjab and Rajasthan to the east, the Pakistani province of Sindh to the south, the province of Balochistan to the southwest, the province of Khyber Pakhtunkhwa to the west, and the Islamabad Capital Territory to the north. The capital and largest city is Lahore which was the historical capital of the wider Punjab region. Other important cities include Faisalabad, Rawalpindi, Gujranwala, Sargodha, Multan, Sialkot, Bahawalpur, Gujrat, Sheikhupura, Jhelum and Sahiwal. Undivided Punjab is home to six rivers, of which five flow through Pakistani Punjab. From west to east, these are: the Indus, Jhelum, Beas, Chenab, Ravi and Sutlej. Nearly 60% of Pakistans population lives in the Punjab. It is the nations only province that touches every other province; it also surrounds the federal enclave of the national capital city at Islamabad. In the acronym P-A-K-I-S-T-A-N, the P is for Punjab. The province is a mainly a fertile region along the river valleys, while sparse deserts can be found near the border with Rajasthan and the Sulaiman Range. The region contains the Thal and Cholistan deserts. The Indus River and its many tributaries traverse the Punjab from north to south. 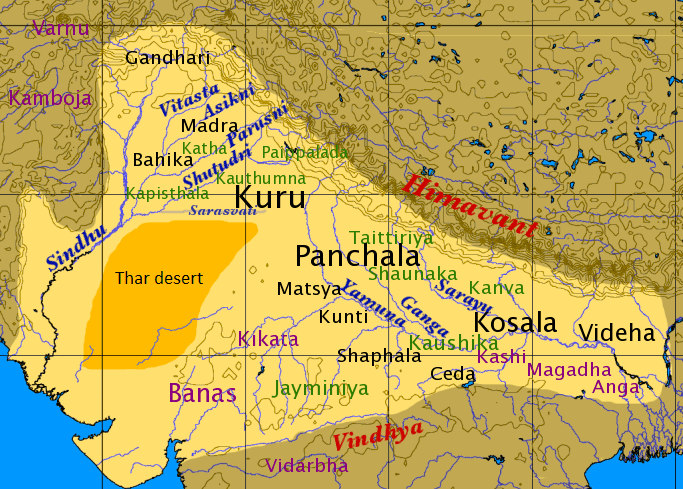 Punjab during Mahabharata times was known as Panchanada. Punjab was part of the Indus Valley Civilization, more than 4000 years old. The main site in Punjab was the city of Harrapa. The Indus Valley Civilization spanned much of what is today Pakistan and eventually evolved into the Indo-Aryan civilization. The arrival of the Indo-Aryans led to the flourishing of the Vedic civilization along the length of the Indus River. This civilization shaped subsequent cultures in South Asia and Afghanistan. Although the archaeological site at Harappa was partially damaged in 1857 when engineers constructing the Lahore-Multan railroad used brick from the Harappa ruins for track ballast, an abundance of artifacts have nevertheless been found. Punjab was part of the great ancient empires including the Gandhara Mahajanapadas, Achaemenids, Macedonians, Mauryas, Kushans, Guptas, Hindu Shahi, Gurjara-Pratihara and old Rajputana. Agriculture flourished and trading cities (such as Multan and Lahore) grew in wealth. Due to its location, the Punjab region came under constant attack and influence from the west and witnessed centuries of foreign invasions by the Persians, Greeks, Kushans, Scythians, Turks, and Afghans. The city of Taxila, founded by son of Taksh the son Bharat who was the brother of Ram. It was reputed to house the oldest university in the world, Takshashila University. One of the teachers was the great Vedic thinker and politician Chanakya. Taxila was a great centre of learning and intellectual discussion during the Maurya Empire. It is a UN World Heritage site, valued for its archaeological and religious history. Punjab has the largest economy in Pakistan, contributing most to the national GDP. The provinces economy has quadrupled since 1972. Its share of Pakistans GDP was 54.7% in 2000 and 59% as of 2010. It is especially dominant in the Service & Agriculture sectors of the Pakistan Economy. With its contribution ranging from 52.1% to 64.5% in the Service Sector and 56.1% to 61.5% in the Agriculture Sector. It is also major manpower contributor because it has largest pool of professionals and highly skilled (technically trained) manpower in Pakistan. It is also dominant in the Manufacturing sector, though the dominance is not as huge, with historical contributions raging from a low of 44% to a high of 52.6%. In 2007, Punjab achieved a growth rate of 7.8% and during the period 2002–03 to 2007–08, its economy grew at a rate of between 7% to 8% per year. and during 2008–09 grew at 6% against the total GDP growth of Pakistan at 4%. Punjab has been the cradle of civilization since times immemorial. The ruins of Harappa show an advanced urban culture that flourished over 8000 years ago. Taxila, another historic landmark also stands out as a proof of the achievements of the area in learning, arts and crafts. The ancient Hindu Katasraj temple and the Salt Range temples are regaining attention and much-needed repair. The province is home to several historical sites, including the Shalimar Gardens, the Lahore Fort, the Badshahi Mosque, the Rohtas Fort and the ruins of the ancient city of Harrapa. The Anarkali Market and Jahangirs Tomb are prominent in the city of Lahore as is the Lahore Museum, while the ancient city of Taxila in the northwest was once a major centre of Buddhist and Hindu influence. Several important Sikh shrines are in the province, including the birthplace of the first Guru, Guru Nanak. (born at Nankana Sahib). There are a few famous hill stations, including Murree, Bhurban, Patriata and Fort Munro. Religious fairs are held on special days of Islamic significance like Eid ul-Adha, Eid-ul-Fitr, Eid-e-Milad-un-Nabi, Ashura, Laylat al-Qadr and Jumuah-tul-Wida. The main activities on these special occasions are confined to congregational prayers and rituals. Melas are also held to mark these occasions. In addition to the religious festivals, Sikh and Hindu Punjabis may celebrate seasonal and harvest festivals, which include Lohri, Vaisakhi, Basant and Teej. Punjabi cuisine is associated with food from the Punjab region of India and Pakistan. The cuisine has a rich tradition of tandoori cooking. Punjabi cuisine also has been influenced by Mughlai cuisine, a characteristic also featured in the cuisine of Kashmir. The local cuisine is influenced by the agriculture and farming lifestyle that has been prevalent throughout Punjab for centuries, and supported by locally grown staple foods. Distinctively Punjabi cuisine includes sarson da saag, tandoori chicken, shami kebab, and makki di roti. Tandoori cuisine centres on cooking food in the tandoor which is traditional in the Punjab of India and Pakistan. In India, tandoori cooking is traditionally associated with Punjab as Punjabis embraced the tandoor on a regional level and became popular in the mainstream after the 1947 partition when Punjabis resettled in places such as Delhi. In rural Punjab, it is common to have communal tandoors, which are also called tadoors in Punjabi. 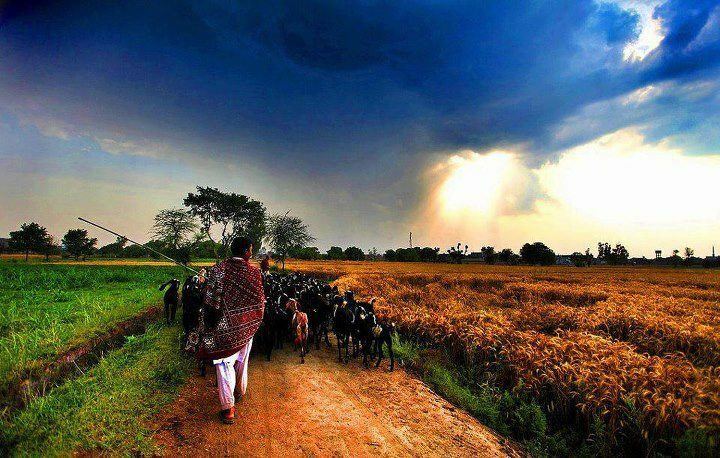 Punjab is a major producer of wheat, rice and dairy products which form the staple diet of Punjabi people. The region has one of the highest capita usage of dairy products in both India and Pakistan, and therefore, dairy products form an important component of Punjabi diet. 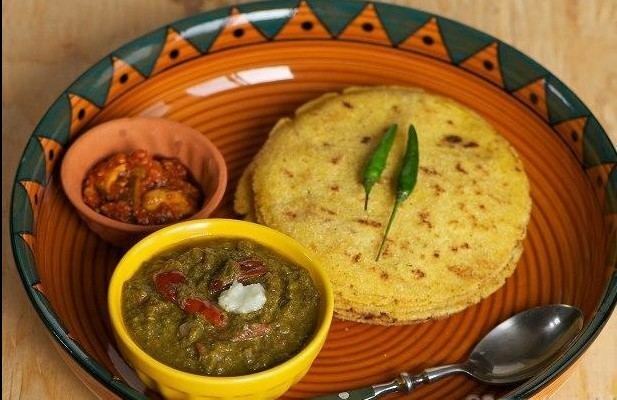 Roti and paratha also form part of the Punjabi staple diet.